(PhysOrg.com) -- A new welding technique for manufacturing horizontal and inclined structures discovered by Cranfield University could radically improve weld-based manufacturing practices, without the need for additional tooling or any type of fixtures or waste materials. As part of this research and based on previous experience of the fabrication of vertical steel walls, the team investigated the fabrication of angled steel walls without the use of any kind of support structures. 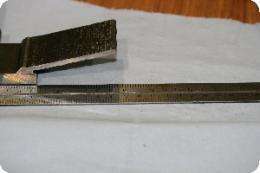 A series of experiments were conducted using an ‘inclined torch' method, resulting in the successful production of a series of inclined walls varying from 60° to 15°. Finally, a horizontal wall section was successfully created, initially as an extension of an existing horizontal section, and tested in the form of a box structure. The RUAM process is capable of producing a range of geometries and features to fit various demands. 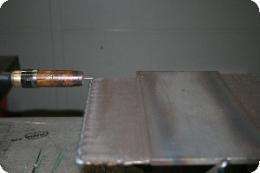 It uses innovative additive layer welding techniques such as Cold Metal Transfer (CMT), which allows for flexible welding strategies at high speeds (currently deposition rates of more than 1kg/hour are possible). The successive process also allows for the mixing of strategies and materials as well as for amending existing metal work pieces. Innovative software for automatically generating robot paths has also been developed as part of this project.